I’m sometimes accused of being too radical, though I take that as a compliment (including the time a British journalist wrote that I was “a high priest of light tax, small state libertarianism”). In reality, I’m actually a moderate. I don’t want to eliminate all government, just the 90 percent that is ineffective or counterproductive. As a result, some of my friends accuse me of being a squish, which is probably a fair characterization since I only scored a 94 out of 160 on Professor Bryan Caplan’s Libertarian Purity Quiz. In my defense, I say let’s get rid of all the programs and departments that clearly shouldn’t exist (such as Transportation, Housing and Urban Development, Education, Energy, and Agriculture), and then we can have a fun discussion of whether the private sector can take over things like roads, policing, and the military. And it does seem that many so-called public goods actually can be handled by the market. I’ve written about private roads and private money, for instance, but the example that really caught my attention was the private, church-run city in Nigeria. And the New York Times has a fascinating story about similar developments in Mexico. Fifteen-foot stone turrets are staffed by men whose green uniforms belong to no official force. Beyond them, a statue of an avocado bears the inscription “avocado capital of the world.” And beyond the statue is Tancítaro, an island of safety and stability amid the most violent period in Mexico’s history. Local orchard owners, who export over $1 million in avocados per day, mostly to the United States, underwrite what has effectively become an independent city-state. Self-policing and self-governing, it is a sanctuary from drug cartels as well as from the Mexican state. …Tancítaro represents a quiet but telling trend in Mexico, where a handful of towns and cities are effectively seceding, partly or in whole. These are acts of desperation, revealing the degree to which Mexico’s police and politicians are seen as part of the threat. The Mexican government is a grim example of the “stationary bandit” in action. Anyhow, back to our story about de facto secession and privatization. …such enclaves…you will find a pattern. Each is a haven of relative safety amid violence, suggesting that their diagnosis of the problem was correct. …The central government has declined to reimpose control, the researchers believe, for fear of drawing attention to the town’s lesson that secession brings safety. Tancítaro is not the only example of a quasi-private town. Rather than ejecting institutions, Monterrey’s business elite quietly took them over… C.E.O.s would now oversee one of the most central functions of government. …they circumvented the bureaucracy and corruption that had bogged down other police reform efforts. Crime dropped citywide. Community leaders in poorer areas reported safer streets and renewed public trust… Monterrey’s experience offered still more evidence that in Mexico, violence is only a symptom; the real disease is in government. The corporate takeover worked as a sort of quarantine. Sadly, the story goes on to say traditional politicians are now regaining control in Monterrey, so the period of good governance is coming to an end. In an ideal world, the central government would allow towns to formally secede, and those towns could then contract to have private management. But that’ll never happen since politicians wouldn’t want real-world examples showing the superiority of markets over government. For now, we’ll have to settle for ad hoc and unofficial secession and privatization. P.S. We can also hope that Liberland succeeds. P.P.S. While today’s topic is de facto secession of local governments, my support for decentralization makes me sympathetic to regional secession. See, for example, Scotland, Liechtenstein, California, Italy, Belgium, and Ukraine. P.P.P.S. I did once write about the “libertarian paradise of Argentina,” but that was mostly in jest. I’m not a big fan of Donald Trump, mostly because I fear his populist instincts will deter him from policies that we need (such as entitlement reform) while luring him to support policies that are misguided (more federal transportation spending). But I admit it’s too early to tell. Maybe my policy predictions on Trump will be as bad as my political predictions about Trump. And, for what it’s worth, I’ll freely acknowledge that Trump’s election is having a very good effect on my leftist friends. Because they fear the new occupant of the White House, they’re now much more sympathetic to the notion that there should be limits on the power of the federal government and they’re acknowledging that maybe federalism isn’t such a bad idea after all. Indeed, some of them are so supportive of limiting the impact of Washington that they’re considering secession! The L.A. Daily News reports on a growing campaign in the Golden State. “Yes California,” a pro-secession group, filed paperwork with the state attorney general in November for a proposed 2018 ballot measure to strike language in the state constitution binding California to the United States. …If its ballot measure succeeds, Yes California would pursue a 2019 vote to declare the state’s independence. …Talk of California secession is nothing new. But it gained momentum after Donald Trump’s election. Hillary Clinton got 62 percent of California’s vote in defeating Trump… According to Yes California, a path to secession exists through the U.S.-ratified United Nations charter. By the way, I thought cozying up to Moscow was a bad thing now. But since the Yes California crowd is even trying to establish relations with Putin-land, I guess coziness is in the eye of the beholder. …the group announced the opening of a “cultural center” in Moscow. …it’s time for the media to stop dismissing the idea as a zany left coast response to the newly elected Republican federal government. …secession could be a reality in our lifetime. …Californians could expect to initiate advanced-level progress in racial justice…free of restriction an independent California could actually demonstrate the success of progressive values in action… It’s difficult to say whether California’s rich Democrats in coastal enclaves would be down with paying reparations if the independent nation were scrapping its ties to the U.S. and its colonial past. But a column in the L.A. Times by Conor Friedersdorf says statist values would suffer if California became independent. 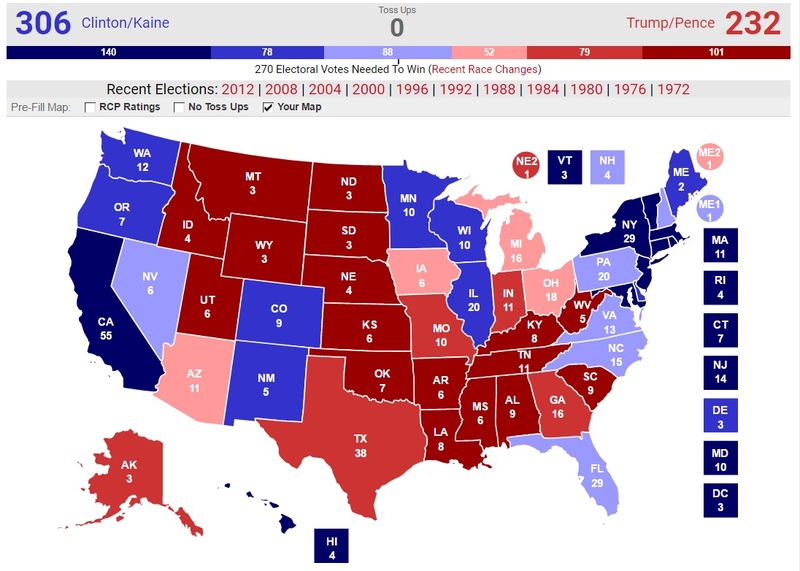 Blue America would lose its biggest source of electoral votes in all future elections. The Senate would have two fewer Democrats. The House of Representatives would lose 38 Democrats and just 14 Republicans. The U.S. 9th Circuit Court of Appeals, among the most liberal in the nation, would be changed irrevocably. And the U.S. as a whole would suddenly be a lot less ethnically diverse than it is today. For those reasons, Trump, Senate Majority Leader Mitch McConnell, Speaker of the House Paul Ryan, Republicans with White House ambitions, opponents of legalizing marijuana, advocates of criminalizing abortion and various white nationalist groups might all conclude –– for different reasons –– that they would benefit politically from a separation, even as liberals and progressives across America would correctly see it as a catastrophe. Which may explain why many folks on the right are cheering for secession. Here are some excerpts from another column in the L.A. Times. …judging by the letters we’ve received from across the country on the burgeoning secessionist movement known as “Calexit,” some readers would be happy see us go — or at least take pleasure in watching our deep-blue state suffer… I have some advice to the sane citizens of California: Members of the middle class should start planning their own exit. When California loses all those billions from the federal government, the politicians are going to need to find money elsewhere, and you know Hollywood’s millionaires aren’t going to provide it. They’ll move to their mountain homes in Wyoming or elsewhere. You think all those new billionaires in Silicon Valley will eagerly part with their money? Think again. They’ll hide their wealth in tax shelters. The refugees and illegal immigrants on the receiving end of California’s generous benefits aren’t going to provide needed tax revenues, so the politicians will target the middle class. Of course they’ll target the middle class. That’s what they want in Washington. That’s why they want a value-added tax. Simply stated, you can’t have a cradle-to-grave welfare state unless the middle class is so over-taxed that they have to rely on government for healthcare, education, retirement, and just about everything else. But that’s an issue for another day. Let’s keep our focus on California secession, which I support both as a matter of self-determination and as a matter of public policy. With regards to policy, I think it will be very interesting to see how a state with huge natural advantages (coast, weather, mineral resources, agricultural land, etc) can endure bad policy. And there’s already plenty of bad policy in the state. A big part of the problem is that the public sector in California is wildly overcompensated. Kevin Williamson explains. State and local government spending adds up to nearly 20 percent of California’s economic output, while thriftier states such as Texas and New Hampshire spend less than 15 percent. …California’s government, like the federal government and most other state and local governments, spends its money on salaries, benefits, pensions, and other forms of employee compensation. The numbers are contentious — for obvious political reasons — but it is estimated that something between half and 80 percent of California’s state and local spending ultimately goes to employee compensation. …The first and smaller problem is that many government workers are paid too much. …The second and larger problem with public-sector workers is that there are a whole lot of them. …When politicians talk about “investments,” we think they mean bridges and research laboratories and canals to bring water to central California. But what they are investing in is dependency. In California, that means creating a lot of full-time jobs for Democrats. But it’s not just that there are too many bureaucrats and that they are overpaid. They also become a big burden when they retire. Here’s some additional evidence of the mess in California. California is already paying $5.38 billion to the California Public Employees’ Retirement System this year, and in fiscal year 2018 the state will need to add at least $200 million more. By fiscal year 2024 the annual tab will increase at least $2 billion from current levels. This all comes on top of increases already scheduled under the system, according to Governor Jerry Brown’s finance department. …California’s revenue is volatile because it draws a large share of taxes from wealthy residents whose incomes are tied closely to the stock market. The top 1 percent of earners — who tend to own shares — accounted for nearly half of the state’s personal income-tax collections in 2014. And the big tax hikes that will be imposed on the middle class will add to the misery they already suffer. Here’s more evidence of how the middle class is being eviscerated. Victor David Hanson bemoans the outlook for his state. The state is currently experiencing another perfect storm of increased crime, decreased incarceration, still ongoing illegal immigration, and record poverty. All that is energized by a strapped middle class that is still fleeing the overregulated and overtaxed state, while the arriving poor take their places in hopes of generous entitlements, jobs servicing the elite, and government employment. …Go to a U-Haul trailer franchise in the state. The rental-trailer-return rates of going into California are a fraction of those going out. Surely never in civilization’s history have so many been so willing to leave a natural paradise. …What makes the law-abiding leave California is not just the sanctimoniousness, the high taxes, or the criminality. It is always the insult added to injury. We suffer not only from the highest basket of income, sales, and gas taxes in the nation, but also from nearly the worst schools and infrastructure. We have the costliest entitlements and the most entitled. Little wonder, as Hans Bader explains, businesses continue to flee the state. Nestlé USA, “the maker of Häagen-Dazs, Baby Ruth, Lean Cuisine, and dozens of other mass brands,” is moving its U.S. headquarters from California to Virginia. It is among many businesses that have left California in recent years. In 2010, Northrop Grumman Corp. moved its headquarters out of California, leaving the state that gave birth to the aerospace industry without a single major military contractor based there. Last Spring, the parent company of Carl’s Jr., founded in Anaheim, California, 60 years ago, relocated its headquarters to Nashville, Tennessee, where there is no state income tax. …reported the San Jose Mercury News in June 2016. “During the 12 months ending June 30, the number of people leaving California for another state exceeded by 61,100 the number who moved here from elsewhere in the U.S., according to state Finance Department statistics. ‘They are tired of the expense of living here. They are tired of the state of California and the endless taxes here,’ said Scott McElfresh, a certified moving consultant. ‘People are getting soaked every time they turn around.’” …For businesses, the worst is yet to come. California is increasing its minimum wage over the next several years to $15 per hour. …the increase will ultimately cost California 700,000 jobs. An economist at Moody’s calculated that 31,000 to 160,000 California manufacturing jobs will be lost. 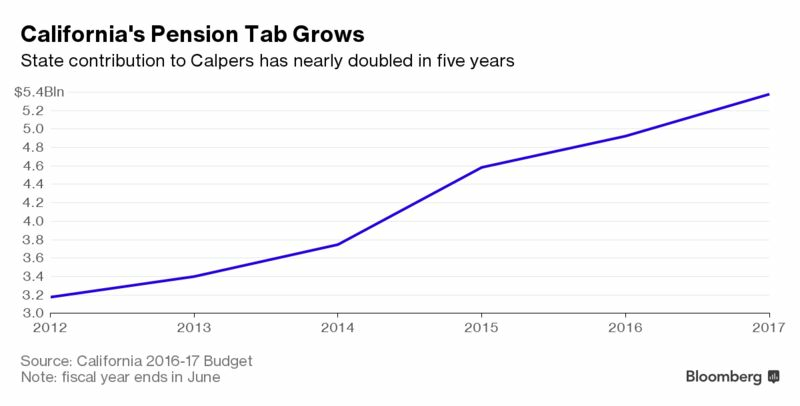 California taxes may rise further, to deal with a rising state budget deficit over the next decade. The deficit is rising in part due to California’s unusually high state welfare spending which grew about twice as fast in California in 2016 as in the U.S. as a whole. California also spends its transportation dollars very poorly, and it is wasting billions on a high-speed rail boondoggle that few people will ride. Indeed, Bader’s column illustrates the real reason why CalExit almost certainly will lead to disaster. People and businesses will vote with their feet. So unless the politicians in Sacramento decide to erect a barbed wire fence around the border (maybe we shouldn’t joke), the state’s feudalistic economic system will be unsustainable. Though there is an alternative scenario. Perhaps independence will have a sobering effect on the state’s kleptocrats and they’ll recognize the importance of quasi-sensible policy once California is an independent nation. This is a big reason why I’m sympathetic to independence movements in place such as Sardinia, Scotland, and Belgium. When there are lots of competing jurisdictions, there’s pressure on all politicians to be rational stationary bandits rather than predatory roving bandits. The concept of secession (part of a jurisdiction breaking away to become independent) has a bad reputation in the United States because it is linked to the reprehensible institution of slavery. But, as Walter Williams has explained, secession today may be an effective way of protecting liberty from ever-expanding centralized government. And I’ve favorably written about secessionist movements in Sardinia, Scotland, and Belgium, largely because the historical data shows that better policy is more likely when there are many jurisdictions competing with each other. So it was with considerable interest that I saw an article in Fortune about a secessionist movement in California. “Calexit” didn’t start with Donald Trump, but his victory on Election Day certainly sparked more interest in the idea. A play on “Brexit,” it’s the new name for the prospect of California seceding from the U.S. The movement…seems to have gained steam in the past six months, thanks in part to the U.K.’s recent Brexit vote and Donald Trump being elected president. …The group’s goal is to hold a referendum in 2018 that, if passed, would transition California into its own independent country. …the movement has even grabbed the attention of some potential Silicon Valley bankrollers. I like this idea, though I’m not sure it’s good for California since the state faces very serious long-run challenges. Though this is one of the reasons I like secession. As an independent nation, California no longer would have any hope of getting a bailout from Washington, so the politicians in Sacramento might start behaving more responsibly. And there are examples of secession in the modern world, such as Slovakia and the Czech Republic emerging from Czechoslovakia. That was a very tranquil divorce, unlike what happened in the former Yugoslavia. As is so often the case, we can learn a lot from Switzerland. There is a right of secession, albeit dependent on a nationwide vote of approval. Municipalities also can vote to switch cantons, as happened in 1996 when Vellerat left Bern and became part of Jura. By the way, villages in Liechtenstein have the unilateral right to secede from the rest of the nation (though that seems highly unlikely since it is the second-richest nation in the world). Notwithstanding these good role models, the secessionist movement in California presumably won’t get very far. But maybe full-blown secession isn’t necessary. If Californians don’t like what’s happening in Washington (or, for that matter, if Texans aren’t happy with the antics in DC), that should be an argument for genuine and comprehensive federalism. In other words, get rid of the one-size-fits-all policies emanating from the central government and allow states to decide the size and scope of government. California can decide to do crazy things (such as regulate babysitters and give bureaucrats too much pay) and Texas can choose to do sane things (such as no income tax), but neither state could dictate policy for the entire nation. This also happens to be the system envisioned by America’s Founding Fathers. Think of federalism as a live-and-let-live system. New York doesn’t have to become North Dakota and Illinois doesn’t have to become Alabama. Red states can be red and blue states can be blue. And we can add all the other colors in the rainbow as well. Let a thousand flowers bloom, and all that. And consider how well federalism works in Switzerland, a nation that doesn’t have a single language, culture, or religion. Now, perhaps, you’ll understand why I even suggested federalism as a solution to the mess in Ukraine. P.S. If California actually chooses to move forward with secession, the good news is that we already have a template (albeit satirical) for a national divorce in the United States. P.P.S. Here’s an interesting historical footnote. There’s a small part of Germany that is entirely surrounded by Switzerland. This enclave wanted to become part of Switzerland many decades ago, but there was no right of secession notwithstanding overwhelming sentiment for a shift of nationality. A whopping 96 percent of the inhabitants voted for annexation by Switzerland. The people had spoken loud and clear, but their voices were ignored. As the Swiss were unable to offer Germany any suitable territory in exchange, the deal was off. Büsingen would remain, somewhat reluctantly, German. Since Germany is a reasonably well-run nation, I guess we shouldn’t feel too sorry for the people of Büsingen (unlike, say, the residents of Menton and Roquebrune in France, who used to be part of a tax haven but now are part of a tax hell). P.P.P.S. Let’s close with some additional election-related humor. Here’s some satire from the twitter account of the fake North Korean News Service. And here’s another Hitler parody to add to our collection. And here’s Michelle Obama feeling sad about what’s about to happen. P.P.P.P.S. We also have some unintentional humor. When Trump prevailed, Paul Krugman couldn’t resist making a prediction of economic doom. Since markets have since climbed to record highs, Krugman’s forecasting ability may be even worse than all the hacks who predicted Brexit would result in economic calamity for the United Kingdom. Secession in the Modern World: Should Sardinia Leave Italy and Join Switzerland? What’s the best country in the world? My emotional response is that the United States belongs in the top spot. But a more dispassionate analysis suggests that Switzerland is more deserving of the honor. It has the 4th-freest economy according to the most recent rankings from Economic Freedom of the World, eight spots above the United States. 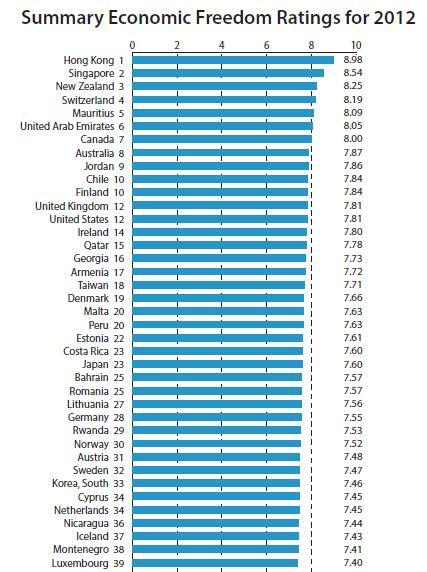 And it is ranked #2 in the Human Freedom Index, 18 spots higher than America. There are several specific reasons why Switzerland is a good role model. It still maintains real federalism, and government is constrained when it takes place at the canton and municipal level. It has a lower burden of government spending, in part because of a very successful limit on yearly spending increases. The nation’s financial privacy laws, though weakened by foreign pressure, still provide some protection for human rights. There is a strong tradition of gun ownership. Perhaps most important, the Swiss people are eminently sensible, as seen by their votes in favor of a spending cap and against class-warfare taxation, minimum-wage mandates, single-payer healthcare, and the death tax. I’m not sure I would trust my fellow Americans to show similarly sound judgement. So it’s surely true that there are lots of reasons to admire Switzerland. Indeed, it’s such an attractive country that many people in Sardinia want to secede from Italy and have their island become a Swiss canton. Here are some passages from a report in the Wall Street Journal. “In Sardinia, people want to be Swiss.” Welcome to “Canton Marittimo,” or “Canton of the Sea,” a bid by Mr. Caruso, a 51-year-old dentist from Sardinia, and his comrade Enrico Napoleone, a car dealer there, to liberate Sardinia from Italy and tether it to Switzerland. …With a population of 1.5 million, the island, which lies between Italy and Spain, is today home to more than 10 parties calling for secession from Rome, emphasizing a culture, dialect, and history distinct from Italy’s mainland. …Mr. Caruso says…“Switzerland is the ideal nation to help us secure our culture and traditions.” … “Most of the local population would go for it, starting tomorrow,” said Matteo Colaone, a spokesman for Domà Nunch, a separatist group in the Italian regions surrounding Milan. And what do the Swiss think about this idea? At least one lawmaker likes the idea of adding cantons, though the government’s official position is not very welcoming. In 2010, a member of Swiss parliament named Dominique Baettig proposed amending the constitution to aid regions in neighboring countries that want to become new cantons. Switzerland’s executive branch swiftly condemned it as “an unfriendly political act.” …There is little evidence the Swiss would want to adopt a rocky island that has many more sheep than people and per-capita economic output just one fourth that of Switzerland’s. Here’s a video report on the topic from the WSJ. In any event, it’s easy to understand why Sardinians are anxious to leave Italy and become part of Switzerland. Here are some excerpts from a story in the U.K.-based Guardian. “We think of Switzerland as a good teacher who could lead us on a path of excellence.” As the 27th canton, Sardinia, so goes the argument, would bring the Swiss its miles of stunning coastline and untapped economic potential. Sardinia could retain considerable autonomy, while also reaping the benefits of direct democracy, administrative efficiency and economic wealth. Whereas staying in Italy means endless statism. …their frustrations with inefficient public spending, complex layers of decision-making and intimidating bureaucracy can be heard throughout the country. …being a small businessman in Italy was “a continuous battle”. “It is fighting every day with a problem that the administration, the bureaucracy, creates instead of solves,” he said. And while the Swiss government doesn’t seem overly excited about adopting Sardinia, ordinary Swiss citizens seem to like the idea. An online poll of 4,000 people asking, in German, “should we accept Sardinia?” produced a 93% yes vote. I suspect that an actual referendum in Switzerland wouldn’t be that lopsided, and the final result would probably depend on whether Swiss voters thought Sardinians were simply seeking good policy or whether they were looking for big handouts (Switzerland does have some redistribution from rich cantons to those with more modest incomes). The bottom line is that there’s scholarly evidence suggesting that supporters of decentralization, self-determination, and limited government should favor the ability of regions to either declare independence or choose to join neighboring countries (assuming there’s a mutual desire for union). That why I think secession or radical decentralization is/was the right approach in Ukraine, Belgium, and Scotland. And as Walter Williams points out, secession can be peaceful, such as when Norway left Sweden early last century. So I hope Sardinia moves forward. Yes, it would be best for them to become part of Switzerland (and there already is an Italian-speaking canton). But even if the Swiss ultimately aren’t interested, the Sardinians at least would have a chance to escape Italy’s dysfunctional economic policies if they became independent. P.S. The seven villages of Liechtenstein have the right to secede. P.P.S. On a lighter note, here’s what would happen if the American right and left decided to secede from each other. P.P.S. In our final postscript, let’s look at some fresh data about Switzerland. 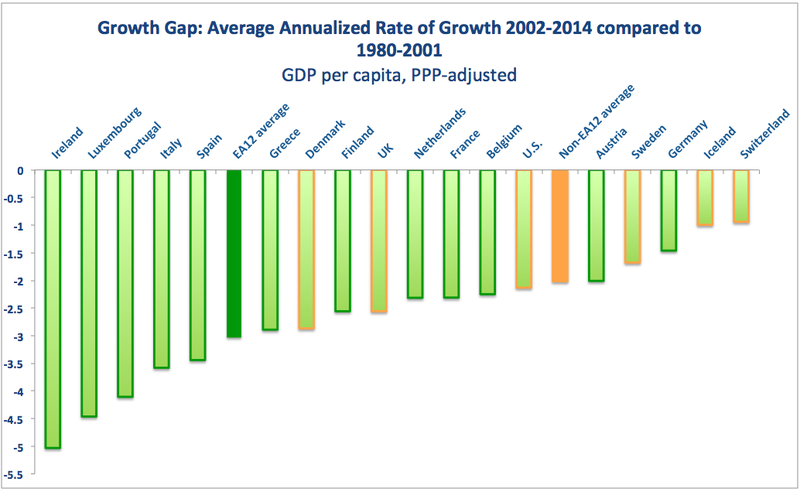 Check out this chart (h/t: Constantin Gurdgiev) looking at how growth rates have changed in various European nations. As you can see, the 2002-2014 period has been grim for all nations compared to the years between 1980-2001. But Switzerland has had the smallest decline. By the way, the left is always arguing that high tax burdens are necessary to help the poor. 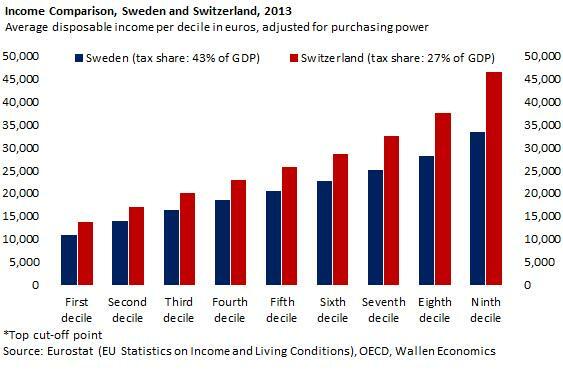 But as you can see from this chart (h/t: Fabian Wallen), every single income group is better off in low-tax Switzerland than high-tax Sweden. In other words, big government is bad news for everyone (other than insiders), but it’s especially bad for poor people. Bono realizes that capitalism is the right model for upward mobility. Now let’s hope Pope Francis learns the same lesson. Back in 2012, I shared some superb analysis from Investor’s Business Daily showing that the United States never would have suffered $1 trillion-plus deficits during Obama’s first term if lawmakers had simply exercised a modest bit of spending restraint beginning back in 1998. And the IBD research didn’t assume anything onerous. Indeed, the author specifically showed what would have happened if spending grew by an average of 3.3 percent, equal to the combined growth of inflation plus population. Remarkably, we would now have a budget surplus of about $300 billion if that level of spending restraint continued to the current fiscal year. This is a great argument for some sort of spending cap, such as the Swiss Debt Brake or Colorado’s Taxpayer Bill of Rights. But let’s look beyond the headlines to understand precisely why a spending cap is so valuable. If you look at the IBD chart, you’ll notice that revenues are not very stable. This is because they are very dependent on the economy’s performance. During years of good growth, revenues tend to rise very rapidly. But when there’s a downturn, such as we had at the beginning and end of last decade, revenues tend to fall. But you don’t have to believe me or IBD. Just look at federal tax revenues over the past 30 years. There have been seven years during which nominal tax revenues have increased by more than 10 percent. But there also have been five years during which nominal tax revenue declined. This instability means that it doesn’t make much sense to focus on a balanced budget rule. All that means is that politicians can splurge during the growth years. But when there’s a downturn, they’re in a position where they have to cut spending or (as we see far too often) raise taxes. But if there’s a spending cap, then there is a constraint on the behavior of politicians. And assuming the spending cap is set at a proper level, it means that – over time – there will be shrinking levels of red ink because the burden of government spending will grow by less than the average growth rate of the private economy. In other words, compliance with my Golden Rule! Let’s look at other examples. This is also why California periodically gets in fiscal trouble. During years when the economy is growing and generating tax revenue, the politicians can’t resist the temptation to spend the money, oftentimes creating long-run spending obligations based on the assumption of perpetually rapid revenue growth. These spending commitments then prove to be unaffordable when there’s a downturn and revenues stop growing. And as you can see from the accompanying graph, this creates a very unstable fiscal situation for the Golden State. Revenue spikes lead to spending spikes. 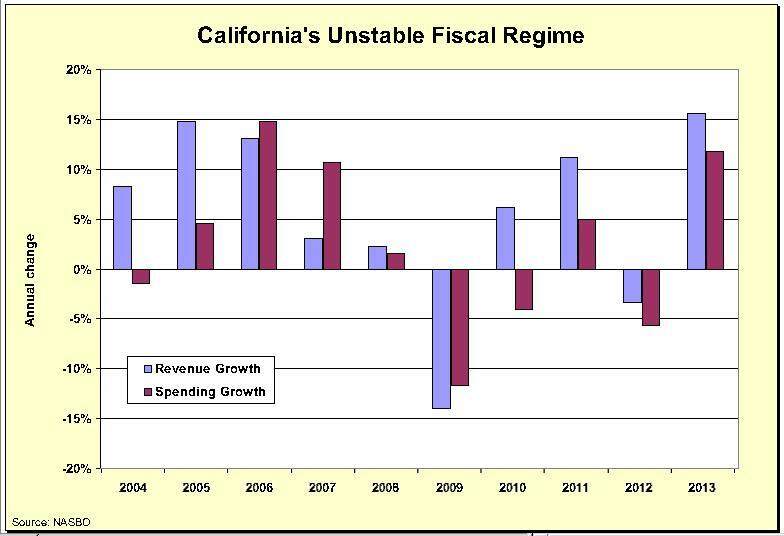 During a downturn, by contrast, revenues are flat or declining, and this puts politicians in a position of either enacting serious spending restraint or (as you might predict with California) imposing anti-growth tax hikes. 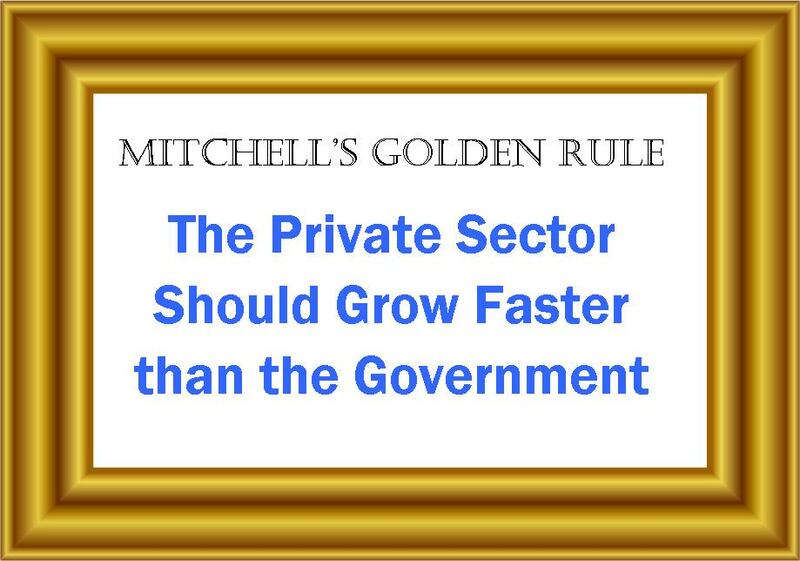 And, in the long run, the burden of spending rises faster than the private sector. We have another example to add to our list, thanks to some superb research from Canada’s Fraser Institute. They recently released a study examining fiscal policy in the energy-rich province of Alberta. In particular, the authors (Mark Milke and Milagros Palacios) look at the rapid growth of spending between the fiscal years 2004/05 and 2013/14. By the mid-2000s, even though the province was again spending at a level that contributed to deficits in the early 1990s, after 2004/05 the province allowed program spending to escalate even further and beyond inflation and population growth. The result was that by 2013/14, the province spent $10,967 per person on government programs. 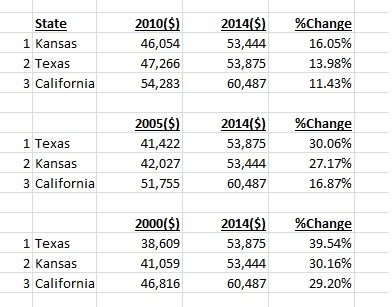 That was $2,002 higher per person than in 2004/05. Why did the burden of spending climb so quickly? The simple answer is that bigger government was enabled by tax revenue generated by a prospering energy industry. Over a nine-year period, politicians spent money based on an assumption that high energy prices were permanent and that tax revenues would always be surging. But now that energy prices have fallen, politicians are suddenly facing a fiscal shortfall. Simply stated, there’s no longer enough revenue for their spending promises. This fiscal mess easily could have been avoided if the fecklessness of Alberta politicians had been constrained by some sort of spending cap. The experts at the Fraser Institute explain how such a limit would have precluded today’s dismal situation. 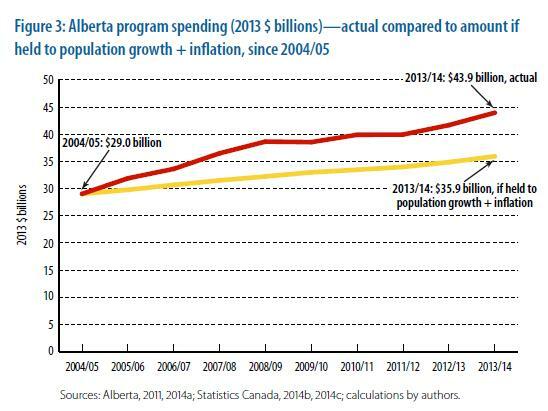 Had the province increased program spending after 2004/05 but within population growth plus inflation, by 2013/14 the province would have spent $35.9 billion on programs. Instead, the province spent $43.9 billion, an $8 billion difference in that year alone. That $8 billion difference is significant. In recent interviews, Alberta Premier Jim Prentice has warned that the drop in oil prices has drained $7 billion from expected provincial government revenues. Thus, past decisions to ramp up program spending mean that additional provincial spending (beyond inflation and population growth) is at least as responsible for current budget gap as the decline in revenues. And here’s a chart from the study showing how much money would have been saved with modest fiscal restraint. …the decision by the province to spend (on programs) above the combined effect of population growth and inflation between 2005/06 and 2013/14 inclusive built in higher annual spending obligations, that, once revenues declined, would open up a fiscal gap in the province’s budget. As of 2013/14, the result of spending more on programs than inflation plus population growth combined would warrant meant program expenses were $8 billion higher in that year alone. The province’s past fiscal choices have now severely constricted present choices on everything from balanced budgets to tax relief to additional capital spending. If the province wishes to have a better menu of choices in the future, it must, obviously, control expenditures more carefully. Since I’ve shared all sorts of bad examples of how nations get in trouble by letting spending grow too fast over time, let’s look at a real-world example of a spending cap in action. 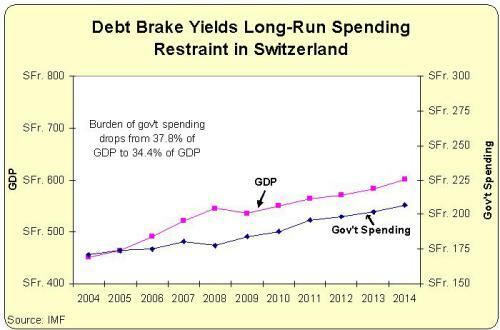 As you can see from the chart, Switzerland has enjoyed great success ever since voters imposed the debt brake. Indeed, while many other European nations are in fiscal crisis because of big increases in the burden of government spending, the Swiss have experienced economic tranquility in part because the size of the public sector has gradually declined. The key lesson isn’t that spending restraint is good, though that obviously is important. The most important takeaway is that spending restraint appears to be sustainable only if there is some sort of permanent external constraint on politicians. Like the debt brake. Or like Article 107 of Hong Kong’s Basic Law. Remember, there are many nations that have enjoyed good results because of multi-year periods of spending restraint. But many of those countries saw their gains evaporate because policies then moved in the wrong direction. *Greek politicians also took advantage of low interest rates last decade (a result of joining the euro currency) to engage in plenty of debt-financed government spending, which meant the economy was even more vulnerable to a crisis when revenues stopped growing. **Some of today’s politicians in Alberta are probably long-term incumbents who helped create the mess by over-spending between 2004/05 and today, so I wouldn’t be surprised if they opted for destructive tax hikes instead of long-overdue spending restraint. P.S. On a totally separate topic, it appears some towns in New York are listening to the sage advice of Walter Williams on the topic of secession. Here are some excerpts from an editorial published by the Wall Street Journal. Some 15 towns have announced they want to secede from New York and become part of neighboring Pennsylvania. …The towns occupy four counties in New York State’s “Southern Tier,” just across the Pennsylvania state line. Pennsylvania allows fracking for natural gas… That part of Pennsylvania is booming. Upstate New York, as anyone who drives through it can attest, is an economic bummer. …Governor Cuomo has created an American version of the Cold War’s East Berlin—with economic life booming on one side of the divide, while an anti-economic ideology stifles it on the other. Unfortunately, New York’s East Berliners will have to pick up and move if they want to benefit from better policy in the Keystone State. There is no chance the secessionists will succeed, needing approval from the legislatures of New York, Pennsylvania and the U.S.
Another option, of course, is to decentralize decision making so that local communities can decide policy rather than faraway politicians in a state capitol. That’s the approach that perhaps would have averted the catastrophe we now see in Ukraine, so why not try it in places where the stakes are simply jobs rather than life and death? Would Scottish Independence Be a Net Plus for Liberty? This Thursday, Scottish voters decide whether they want to break away from the United Kingdom and reclaim their independence. Do advocates of economic liberty in America have a dog in this fight? Well, there’s very solid academic evidence from economic historians that Europe originally became rich precisely because power was decentralized among lots of small jurisdictions that had to compete with each other. Moreover, I’ve argued that we’d get better policy if Belgium split into two nations. So would the same be true if Scotland broke off from the United Kingdom? Niall Ferguson, born in Scotland, is opposed. I’m sure that many pro-independence politicians in Scotland are looking out for themselves, so that’s a compelling argument. And David Frum is similarly skeptical, arguing that the United States should worry about an independent Scotland. A vote in favor of Scottish independence would hurt Americans…a ‘Yes’ vote would immediately deliver a shattering blow to the political and economic stability of a crucial American ally and global financial power. The day after a ‘Yes’ vote, the British political system would be plunged into a protracted, self-involved constitutional crisis. …a ‘Yes’ vote would lead to a longer-term decline in Britain’s contribution to global security. The Scottish separatists have a 30-year history of hostility toward NATO. …a ‘Yes’ vote would embitter English politics and empower those who wish to quit the European Union. …The United States has traditionally preferred an EU that includes the U.K. …a ‘Yes’ vote would aggravate the paralysis afflicting the European Union. Since I’m not a fan of the European Union and I think NATO is a bureaucracy that has lost its purpose, some of these arguments don’t move me. However, I do believe the world is a better place because of the United Kingdom, so David’s core argument shouldn’t be dismissed. But there are other voices that have a more optimistic assessment. Here’s Ewan Watt, one of the few Scotsmen I personally know, arguing in the Daily Caller that independence will force his statist countrymen to rein in their big-government impulses. I’ve often been asked to try and summarize the tortuous Scottish independence campaign from a libertarian perspective to an American audience. …this nicely sums up the independence campaign: Scots and other Scots fighting over who can further spread the specter of socialism, inhibit individual liberty, and, ultimately, ruin Scotland. Both sides have strived to out-promise each other on more public spending, greater economic centralization, and cradle-to-grave public services. Statists fighting for more statism? Sort of like Bush v Obama? That doesn’t sound like someone who thinks independence will produce good results. And yet…, independence could ultimately provide a boon to the movement and rejuvenate classical liberal ideas in the land that helped give them life. Given that Scotland lacks the tools that even a U.S. state possesses to attract external investment, it’s little surprise that at times it’s been nothing but a laboratory for successive socialist experiments. …Under independence Scotland will be forced to create an economic environment that can compete with both the lure of London and Ireland’s 12.5 percent corporation tax, while also avoiding the very government largesse and fragile financial system that the Bank of England has been able to artificially prop up. Far from becoming a socialist utopia, the conditions of independence will not only force Scotland to live under strict fiscal discipline, but embrace the very free-market philosophy that she helped export to prosperous nations around the world. And my Cato colleague David Boaz also thinks an amicable divorce will lead to more economic freedom. Here’s some of what he wrote for USA Today. …whatever the benefits of union might have been in 1707, surely they have been realized by now. And independence for any country ought to appeal to Americans. So herewith a few arguments for independence. …England and Scotland are both nations with history and culture. They need not be combined in one state. …There’s some evidence that small countries enjoy more freedom and prosperity than larger countries. …Alex Salmond, the leader of the Scottish National Party and the likely first prime minister of an independent Scotland, may be a socialist, but he’s not an idiot. He knows that a tax hike in Scotland wouldn’t work. Asked in a televised debate, he responded, “We don’t have proposals for changing taxation. We certainly are not going to put ourselves at a tax disadvantage with the rest of the UK.” …With a top British tax rate of 45 percent, and 41 percent in Ireland, Salmond doesn’t want to raise the Scottish rate to 50 percent and push out top earners. …An independent Scotland would have to create its own prosperity, and surely the people who produced the Enlightenment are smart enough to discover the failures of socialism pretty quickly if they become free, independent, and responsible for their own future. …Scotland had a successful independent monetary system from 1716 to 1845,… So maybe it doesn’t need the pound sterling. By the way, the independent monetary system David mentions was based on competitive currencies and it is perhaps the best example of a free-market monetary policy. But that’s a topic for another day. Back to the issue of Scottish independence, a former Cato Institute expert, Patrick Basham, also writes that an independent Scotland will have no choice other than capitalism. Scotland is an anachronistic place where leftist thinking remains in vogue. Scots strongly dislike, for example, the UK government’s introduction of market forces and fiscal discipline into the provision of health care, education, and welfare. …Although the Scots are ideologically to the left of their English neighbors, in practice their semiautonomous government is comparatively frugal. For example, Scotland has a lower deficit and lower public spending relative to GDP than the UK. …Given that Scotland’s top parties, the nationalists and Labor, are left-wing, it’s also possible that an independent Scotland will tax, spend, and regulate itself into an economic tailspin. That would be a travesty for many individual Scots, but not a national tragedy. Hitting the economic wall without a UK-size safety net would teach an invaluable lesson. It would rapidly cure Scotland’s entitlement culture, as a critical mass of taxpayers learned the true cost of fiscally unsustainable statism. …Ultimately, such a self-reliant, market-friendly political culture may transform Scotland into an international center of commerce and finance, such as Hong Kong, or perhaps into a tax haven, such as Guernsey or Jersey. The bottom-line is that, if Scotland decides to go it alone, it will become a very different place. An even better place. I’m very sympathetic to sentiments in these columns, though I’m not as optimistic about an independent Scotland. What happens, after all, if a newly independent Scotland goes through a five-year learning period of statism before it becomes clear that big government doesn’t work? Does that mean Scottish voters will suddenly become libertarians? I hope so, but what if a non-trivial number of productive people emigrate during that period and the majority of those left still vote for handouts and dependency? For instance, I certainly don’t expect the hundreds of thousands of people who get paychecks from government to turn into overnight libertarians. On the other hand, maybe they’ll have no choice, sort of like the piglets in this Chuck Asay cartoon. If you’re undecided on the issue, there is a very good role model for independence. Writing for the Washington Post, Professor Ilya Somin of George Mason University’s Law School adds a very persuasive argument in favor of secession. One relevant precedent is the experience of the “Velvet Divorce” between Slovakia and the Czech Republic, whose success is sometimes cited by Scottish independence advocates as a possible model for their own breakup with Britain. Like many Scottish nationalists, advocates of Slovak independence wanted to break away from their larger, richer, partner, in part so they could pursue more interventionist economic policies. But, with the loss of Czech subsidies, independent Slovakia ended up having to pursue much more free market-oriented policies than before, which led to impressive growth. The Czech Republic, freed from having to pay the subsidies, also pursued relatively free market policies, and both nations are among the great success stories of Eastern Europe. Like Slovakia, an independent Scotland might adopt more free market policies out of necessity. And the rump UK (like the Czechs before it), might move in the same direction. The secession of Scotland would deprive the more interventionist Labor Party of 41 seats in the House of Commons, while costing the Conservatives only one. The center of gravity of British politics would, at least to some extent, move in a more pro-market direction, just as the Czech Republic’s did relative to those of united Czechoslovakia. If the breakup of the UK is likely to resemble that of Czechoslovakia, this suggests that free market advocates should welcome it, while social democrats should be opposed. Ilya is right. The Czech Republic and Slovakia have better policy as separate nations. And I say that even though I’m very disappointed that both nations recently repealed their flat tax systems. Last but not least, let’s add a bizarre voice to the debate. It seems that the crazies from North Korea support an independent Scotland. There’s nothing objectionable in those words, but they come from someone who almost surely is a puppet of one of the most malignant regimes on the planet, so you can’t trust him or his statements. This doesn’t necessarily mean Scottish independence is a bad idea, to be sure, but I surely would understand if an undecided person voted no simply because North Korea wants a yes. But now let’s see what a true public policy expert has to say about the topic. Here’s Groundskeeper Willie from The Simpsons. And since I’m sharing videos, here are the Scots in a very un-European display of patriotism. Gives these Americans a run for the money. That’s almost enough to make me think they’ll vote yes. But my prediction, for what it’s worth, is that Scottish voters will get cold feet and vote no by a 56-44 margin. And if my prediction is right, I’ll offer my two cents on what should happen next. The U.K.’s politicians should agree on a plan of radical decentralization. Sort of what’s already been happening, but on a much bigger scale. The national government should maintain the military, but almost every other function of government should be devolved. England, Northern Ireland, Scotland, and Wales should each decide how much to tax and how much to spend. Sort of like Switzerland, but even better. And what I’ve already recommended for Ukraine. And if it works in these places, maybe we can reclaim our constitutional heritage and do it in America! P.S. Walter Williams argues we should resuscitate the concept of secession in the United States. P.P.S. If you’re intrigued by Walter’s idea, you’ll probably enjoy this bit of humor about a national divorce in the United States. P.P.P.S. The tiny nation of Liechtenstein is comprised of seven villages and they have an explicit right to secede if they become unhappy with the central government in Vaduz. Is Secession a Good Idea? I’m not talking about secession in the United States, where the issue is linked to the ugliness of slavery (though at least Walter Williams can write about the issue without the risk of being accused of closet racism). But what about Europe? I have a hard time understanding why nations on the other side of the Atlantic should not be allowed to split up if there are fundamental differences between regions. Who can be against the concept of self-determination? Heck, tiny Liechtenstein explicitly gives villages the right to secede if two-thirds of voters agree. Shouldn’t people in other nations have the same freedom? This is not just a hypothetical issue. Secession has become hot in several countries, with Catalonia threatening to leave Spain and Scotland threatening to leave the United Kingdom. But because of recent election results, Belgium may be the country where an internal divorce is most likely. Here are some excerpts from a report in the UK-based Financial Times. Flemish nationalists made sweeping gains across northern Belgium in local elections on Sunday, a success that will bolster separatists’ hopes for a break-up of the country. Bart De Wever, leader of the New Flemish Alliance (NVA), is set to become mayor of the northern city of Antwerp, Belgium’s economic heartland, after his party emerged as the largest one, ending about 90 years of socialist rule. …The strong result recorded by the Flemish nationalist is likely to have an impact across Europe, where the sovereign debt crisis, which has seen rich countries bail out poor ones, has revived separatist sentiment throughout the continent. Flanders, which is the most economically prosperous region of Belgium, has long resented financing the ailing economy of French-speaking Wallonia, and Sunday’s victory will strengthen its demand for self-rule. Lieven De Winter, a political scientist at Université Catholique de Louvain, said that Mr De Wever’s victory was a clear step forward for separatists who had long been campaigning for secession from the southern part of the country. Purely as a matter of political drama, this is an interesting development. We saw the peaceful split of Czechoslovakia into the Czech Republic and Slovakia about 20 years ago. But we also saw a very painful breakup of Yugoslavia shortly thereafter. Belgium’s divorce, if it happened, would be tranquil. But it would still be remarkable, particularly since it might encourage peaceful separatist movements in other regions of other nations. I think this would be a welcome development for reasons I wrote about last month. Simply stated, the cause of liberty is best advanced by having a a large number of competing jurisdictions. I’ve opined about this issue many times, usually from a fiscal policy perspective, explaining that governments are less likely to be oppressive when they know that people (or their money) can cross national borders. Belgium definitely could use a big dose of economic liberalization. The burden of government spending is enormous, consuming 53.5 percent of economic output – worse than all other European nations besides Denmark, France, and Finland. The top tax rate on personal income is a crippling 53.7 percent, second only the Sweden. And with a 34 percent rate, the corporate tax rate is very uncompetitive, behind only France. Sadly, there’s little chance of reform under the status quo since the people in Wallonia view high tax rates as a tool for extracting money from their neighbors in Flanders. But if Belgium split up, it’s quite likely that both new nations would adopt better policy as a signal to international investors and entrepreneurs. Or maybe the new nations would implement better policy as part of a friendly rivalry with each other. So three cheers for peaceful secession and divorce in Belgium. At least we know things can’t get worse. P.S. Brussels is the capital of Belgium, but it is also the capital of the European Union. Don’t be surprised if it becomes some sort of independent federal city if Flanders and Wallonia become independent. Sort of like Washington, but worse. Why worse? Because even though Washington is akin to a city of parasites feasting off the productive energy of the rest of America, Brussels and the European Union are an even more odious cesspool of harmonization, bureaucratization, and centralization, richly deserving of attacks from right, left, and center.